Could this friendly fungus protect soybeans from seedling disease? Many of you are aware that a few years ago we collected diseased soybean seedlings from fields across the Midwest and identified organisms associated with the rotted roots. This soybean seedling disease survey was funded by USDA-NIFA and soybean check-off and the identification of the organisms was done in Dr Martin Chilvers' lab at the University of Michigan, and Dr Ahmad Fakhoury's lab at Southern Illinois University. Apart from pathogenic oomycetes and fungi, we also recovered potential biocontrol organisms - fungi and oomycetes that compete with or parasitize pathogens. Dr Fakhoury took the lead and with soybean check-off funding from the North Central Soybean Research Program, we all have been evaluating some potential biocontrol fungi in the lab and greenhouse, and we have field trials planned for this growing season. Yesterday, Vijitha Silva, a research associate in my lab, was collecting data on a greenhouse trial so I went along to have a look. WOW - I was completely surprised. One of the biocontrol fungi we are looking at appeared to have done an outstanding job. 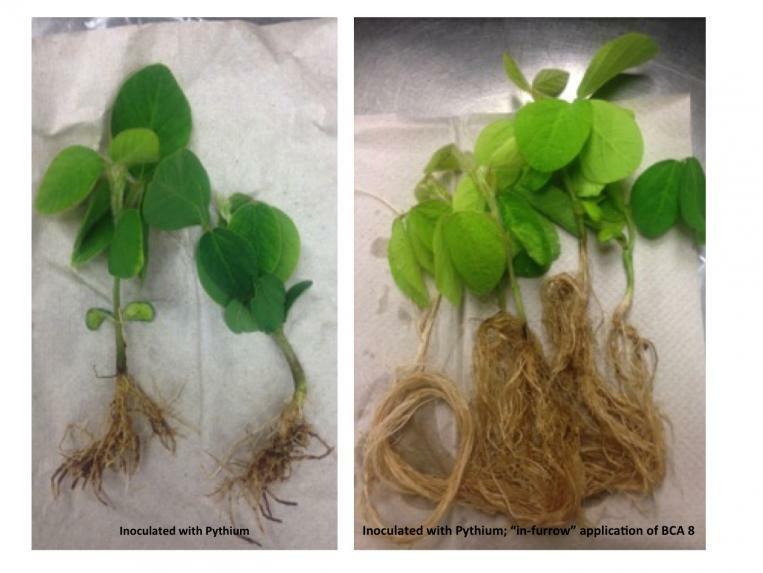 Unfortunately, we did not have a No Pythium control, so we are unable to tell if BCA 8 enhances soybean root growth, as well as protecting against root rot caused by Pythium. It is quite possible that it could; more research will tell. It's "back to the drawing board," but this time there is a little more spring in our step.